Appearances can be deceiving. That’s what I said to myself climbing the tatty, garishly red stairs at Debsh having sought refuge from the dark, damp of a rainy Wollaton Street. Entering the restaurant itself the jury was still out, large speakers dominated what should have been the bar and I had an uninterrupted view of someone washing a few pots in the kitchen. The bare wooden tables are packed into a small space and as we enquired about seating for 2 we weren’t met with much enthusiasm. Although the restaurant was at less than half capacity the (presumed) owner suggested 2 big parties were soon to arrive. Having persevered we were seated and set about reviewing the menu. 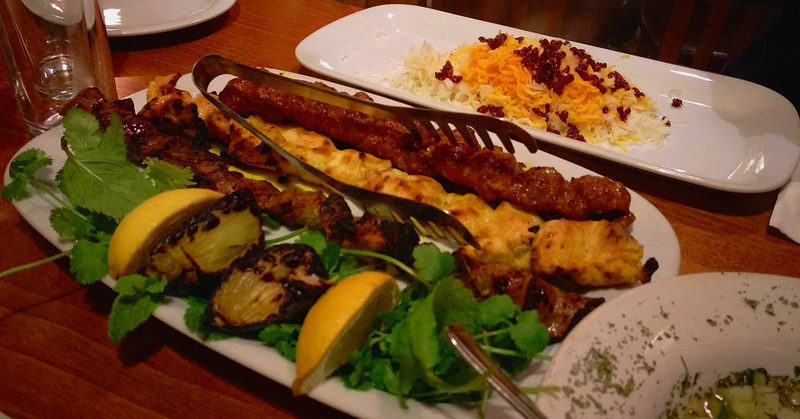 There are lots of grilled dishes alongside traditional Persian stews and some mezze starters. Hunger was getting the better of us so we went straight for a shared kebab main course for £26. It looked almost exactly liked I expected, unapologetically simple. Two minced lamb kebabs were the bulk of the dish but despite being the cheaper meat it didn’t lag in the flavour stakes. Each kebab was distinctive but it was hard to me to distinguish how exactly they had been prepared, the menu unhelpfully said “marinated in seasoning”. My knowledge of Persian cooking was being tested but I at least did have some inside knowledge on the rice. A friend is Iranian and has made dishes with barberries in before and this time sat on top of some very good saffron infused rice. The odd pop of flavour from the berries particularly enjoyable and I could impress my fellow diner with what they were at least. Chicken kebab was also tasty, the most subtle of the three but also the most influenced by the char of the grill. Another lamb kebab was described as being “specially marinated” which really help me out again. Rather than the mince which came before this was succulent chunks of tender lamb, good quality and again very well cooked. Looking back the food seems almost plain, grilled meat and some rice with few embellishments. I feel like there isn’t too much for me to critique alongside my novice status on Persian cuisine, though I believe it is popular amongst the Middle Eastern population of Nottingham. The subtlety of the marination probably belied the skill and ingredients involved but given the descriptions of the dishes I might never know! £26 is a fair whack but there was more than enough food without a starter or dessert to keep two people very happy. Service was functional, mostly the chef covering front of house too which is endearing to a point. They don’t take card which is a bit of a pain as the nearest card machine feels a bit of a trek on an October night. I’d like to return to Debsh to try some more adventurous Persian dishes but I would be struggle not to be tempted to return to a kebab. Or three. Hi Tony – thanks for bringing this to our attention. Not good getting a 1 but worse to cover it up! Just checked the site and they now rate a 2. The markdown is on structural – building concerns not hygiene directly – as they’re closed for building work at the moment hopefully this will be fixed. I’ve eaten there loads and really like the place. Thanks for the update, agree hopefully they get back up. Surprising amount of people do look at the hygiene ratings! Have you been to Pistachio yet? I just went to Pistachio for my birthday! I would have gone to Debsh but it still hasn’t reopened and now I fear it never will. I loved Pistachio! We were a party of six and had almost every starter – best I’ve ever eaten. Unlike you we did have to repeatedly ask for more bread and it wasn’t the typical naan/chapati style (still nice though). We had a couple of the stews and they were both excellent. Rice and regular kebabs very good (but most Iranian places seem to get those right). Only downside is the open grilling area means your clothes reek of charcoal smoke afterwards. I don’t mind but when I recommended Pistachio to a female colleague she said the smoke was a deal breaker. Happy birthday Matt! Glad to hear it was good, I shall have to go again myself. Interesting point around the smoke, didn’t appreciate it would be a problem for some so that’s a good note.